Johnny Koo, Jared Buchanan, Han Lu Ling, Neeki Ashari, Srivaths Kalyan and Tavish Traut. Can beer be brewed on the moon? 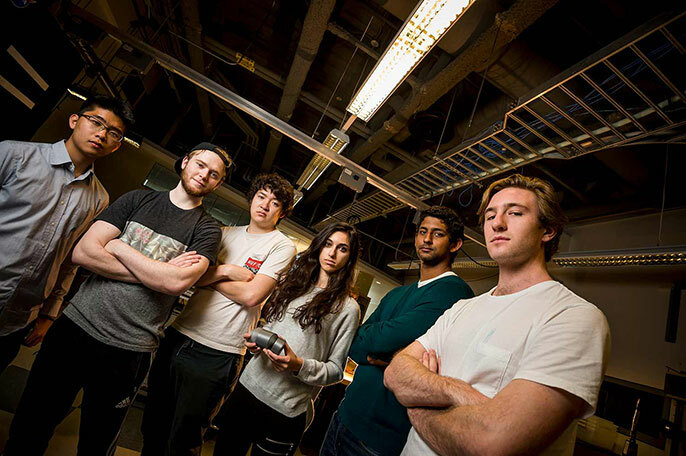 A team of UC San Diego engineering students is hoping to find out. They are finalists in the Lab2Moon competition being held by TeamIndus, one of the four teams with a signed launch contract to send a spacecraft to the moon as part of the Google Lunar XPRIZE challenge. The experiment will test the viability of yeast on the moon—and result in a freshly brewed batch of beer. Understanding how yeast behaves on the moon isn’t just important for brewing beer in space. It’s also important for the development of pharmaceuticals and yeast-containing foods, like bread. The group of Jacobs School of Engineering undergraduates call themselves “Team Original Gravity.” They are one of just 25 teams selected from a pool of 3,000 to compete for a spot aboard TeamIndus spacecraft, which is planned for launch on Dec. 28, 2017. If the team is selected, they will be the first to brew beer in space. The team designed a unique system to accomplish this task. First, the experiment does not brew the "wort," or unfermented beer. Instead, all of the prep work required before yeast is added will be done on Earth, rather than in the experimentation vessel. Secondly, rather than separating the "fermentation" and "carbonation" phases as would normally occur during the process of making beer, the team plans to combine them. This eliminates the need for releasing accumulated CO2, which can result in sanitation and safety issues. It also prevents the possibility of over-pressurization if anything in the system fails and makes the system easier to design. Lastly, the testing of fermentation and yeast viability will be done via pressure, rather than using density measurements as done on Earth. This is because density measurements use gravity. “Converting the pressure buildup to fermentation progress is straightforward, as long as volume and original gravity—specific gravity before fermentation, hence our name—are known prior to the experiment,” said Han Ling, a fifth year bioengineering undergraduate and the team’s brewing lead. Proposed experiments for the competition from all over the globe ranged from photosynthesis to electricity. They will be evaluated by an international jury in March when teams fly to Bangalore, India, to showcase their final prototype. The spacecraft is owned by the Indian startup TeamIndus. The aerospace startup was one of four teams in the world to win a $1 million Milestone Prize for successfully simulating the landing technology concept of its spacecraft. TeamIndus hopes to accelerate a human transition into a sustainable multi-planetary species. To that end, TeamIndus came up with a global challenge issued to students under age 25 to imagine, design and build a project to help accomplish that mission. If UC San Diego’s Team Original Gravity is selected, not only will they be the first to brew beer in outer space, the students believe they’ll be the first to brew beer in a fermentation vessel the size of a soda can. Team Original Gravity also includes UC San Diego students Johnny Koo, Jared Buchanan, Sebastian Kaser, Clarissa Hoffman, Seth Choi, Jeff Cash and Tavish Traut. Team Original Gravity is sponsored by Omega Yeast Labs. For more information about becoming a sponsor, please contact Neeki Ashari at nashari@ucsd.edu.